A wet Sunday evening near (or not so near) Woking an old band visit a new venue. Tonight's show at Bisley Pavilion seems to have been added after the main dates as it isn't listed on some gig guides. It also isn't in a dedicated venue, rather the show takes place in an old Military meeting hall. None of this makes a lot of difference however as the PA and lights are at least as good as certain professional venues. 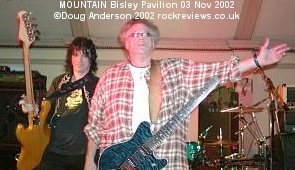 This was the fifth time I've seen Mountain and the third with Corky Laing backing Leslie West. 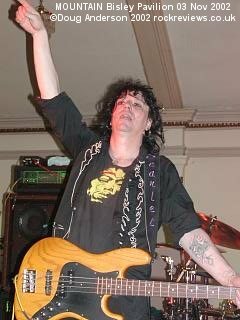 The first time was way back near the beginning of my gigging history, supporting Deep Purple at Knebworth. That day was very wet and the band was about a fifty yards away from me - there were 70,000 other people there too, after all. The last couple of times were at the Brook in Southampton so I was surprised that this tour, only about nine months since the last, didn't return there. Of course, having found this venue it is far handier being just over twenty miles from home and I managed to get almost right up to the stage with very little trouble. During the wait between support and main acts friendly local Neil Smith and his son Steven engaged me in conversation about the venue, Mountain and music in general. Neil had seen Mountain in their heyday around 30 years ago and was introducing the next generation of fa tonight. Little did any of us realise how special tonight would be for one of us. The only problem with the venue is that it really is off the beaten track, a couple of miles from the nearest railway station (Brookwood, between Woking and Farnborough) and situated on an old Army camp. As well as not being the easiest place to find it seems to not have been widely advertised either. One local though a friend that told him about the gig was joking until he saw a poster on a lamppost. A further difficulty was that tickets were only available from Guildford, half a dozen miles to the South, and not locally. I had to risk buying a ticket on the night as nowhere had I seen contact details for the promoters. 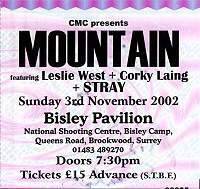 Despite these setbacks (and a few loss-making shows) I think the Mountain show should see a turn in the venues fortunes as my ticket was number 325 and at £15 (or £16 on the door), some of the most expensive tickets on the tour, profit should have been achieved. As usual when Stray are supporting I arrived late, though just marginally tonight it turned out. 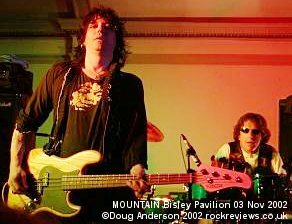 Stray and Mountain seem to be a package in the UK these days as the previous two Mountain shows I'd been to had Del Bromham and the boys supporting. Nothing wrong with that as musically they fit together quite well. 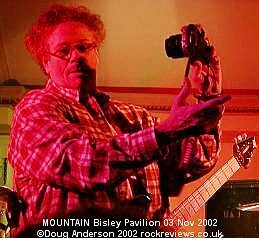 Climbing nonchalantly onstage at twenty to ten (with a slight hand from the roadie onto the stepless two foot high stage) Leslie West played alone for a couple of minutes of beefy powerchord GUITAR INTRO which mellowed as he checked the settings on his microphone stand settings box. He spotted a fan in the front row, a foot or two in front on him, lining up his camera to which Leslie asked for the camera. A little hesitantly the bloke handed it over only to have Leslie turn it towards the guy and attempt to take a picture. Unfortunately the SLR wasn't a guitar so he admitted defeat, handed the camera back and posed for a photo before returning to the music with another blast of echoed guitar. 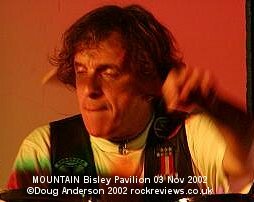 Corky Laing, the other original member of Mountain soon appeared behind the drumkit, complete with long brown leather jacket and black and white striped woolly hat, and joined in with a steady beat to initially back the briefest dabble with the Smoke On The Water riff. 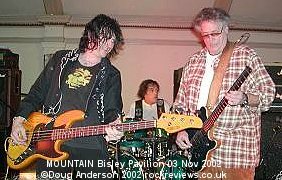 Almost directly this transmogrified into BLOOD OF THE SUN, an appropriate opening number as it dates from the 1969 eponymously tilted debut Leslie West's Mountain album, for which the third member of the trio, Richie Scarlett, joined in on bass. Richie takes the place of Felix Pappalardi. The connection with those in the front row continues as the woman next to the cameraman was handed Leslie's pick during the mid-song lead break. As an added bonus she was offered the chance to use it to play the guitar along with the man himself. Normally people in the front row are fighting over who gets to touch a guitar when it comes near the edge of a stage but tonight the opportunity was freely offered. While Leslie issued some instructions to the sound and lighting engineers "I wanna see these people" Corky took the opportunity to stand up and remove first the jacket then hat and place them neatly over the backline. With Leslie happy that the mood was right for the next track the guitar chugged into something from the offshoot West, Bruce and Laing album, WHY DONTCHA. Part way through Leslie mentioned "From West Bruce and Laing"
Pausing for a second Leslie focused on the youngest member of the front row next, asking "How old are you?". When 11 was the reply he mentioned that was the age he started playing before enquiring "Do you play anything? Drums?" the latter question may have been prompted by the drumstick from the support act that Steven held tightly. The biggest surprise of the evening followed when Steven saud he didn't play any instrument Leslie offered "Well you're going to learn tonight." Up a rather bemused Steven went, joining Corky behind the kit, as Leslie slipped into a verse of the Stones SATISFACTION." Corky initially held Steven's hands but eventually let him go solo and he managed extremely well for a rather stunned first timer. As the great Mr West mentioned as he returned to his front row position with another pair of sticks "That boy has more balls than most of the men in the hall!" Well done Steven. The only drawback that was pointed out to Neil was the $5000 required for a kit! With the surprises over it was back to the music and a track performed live in front of a far larger audience in 1969, FOR YASGURS FARM. "We first did this at Woodstock in 1969 and Yasgur is the guy whose farm it was on." The track is mellow and restrained compared to the rock that surrounded it and provided proof that West isn't just about powerfully attacking guitar. During the first song of the set Leslie had mouthed "voice" to Richie and he now explained to the audience that at a previous gig he "didn't bring a change of clothes to the gig and walked outside and got wet. But I got here and saw you and a I feel better." After an exchange with a rather drunk punter that had squeezed himself between the PA stack and the corner of the stage a long explanation of how Leslie began playing. When he switched to guitar he couldn't work out what the extra strings were for so ripped them off and played a bigger ukulele! His mum then entered him in a radio show contest and assures him that "you're going to win." Unfortunately he didn't and worse he lost to a tap dancer- tapping his fingers on the microphone head to demonstrate the listening pleasure of the radio audience. From there he explained about the West brothers first band, The Vagrants who were introduced to Felix Pappalardi. When Leslie heard Cream and realised the producer was the same Felix Pappalardi "reality set in so I practised" and eventually Mountain came into being. As homage to the record that inspired him onto bigger things Leslie riffed into Cream's CROSSROADS. 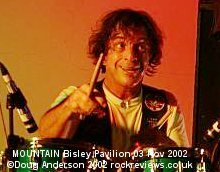 One of Corky Laing's trademarks isn't the drumming but the way he ricochets drumsticks off the cymbals and into the audience. There would be plenty of that later but for now throwing them high and catching was the trick except one didn't quite work out. At the end of the song one fell slight too far back for Corky to catch so he lent back , grabbed another stick and placed it in the empty raised hand and pretended he'd caught it with straight face - but knowing eyes - playing to crowd. Leslie then introduced his sparring partners, "Richie Scarlet who plays with Sebastian (Skid Row) Bach and Ace (KISS) Frehley and my oldest friend for 38 years, Corky Lang." 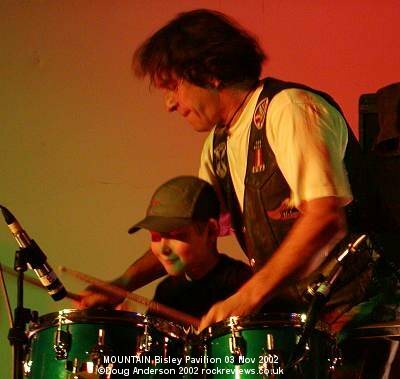 Corky then went padding around the kit and into a rhythmic DRUM SOLO. Leslie added some powerchords from behind his stack then slowly walked round and got up from Richies side to conclude the drum solo as Richie joined in for another touch of the Stones with PAINT IT BLACK. A drumstick went up at end and bounced off roof, almost cracking Richies on the back of his head. Time for the first of the classics you expect at a Mountain show next and Leslie's favourite Mountain song. "It's actually written by Jack Bruce but a lot of people think we wrote it. THEME FOR IMAGINARY WESTERN." Corky started with a padded stick in mouth then used it before returning to his normal ones. Come the "Painted wagons" section and the sticks began flying with another just before Leslie began imitating the Close Encounters of the third Kind communication sounds to which Corky became an automaton cued by those notes. As the instrumental drew to a close Leslie changed guitars and a less jerky Corky stood up and waved for more clapping. Continuing the well-known tunes this next one was NANTUCKET SLEIGHRIDE and Leslie explained what the title actually referred to as he gently strummed into the tune. "When they hunted whales they'd go out and throw the harpoons into the whale." He changed to an evil sounding riff and continued "make the whales real angry" and changed to wailing whale noises from his guitar for about a min before Corky rattled into the main tune joined by Richie for a choppy journey across the sea. Another stick bumped out towards the front row and was snapped up by the camera couple before the vocals began and more sticks were pumped out mid track either side of Leslie as he moved centre stage to jam with Richie. Richie then stepped down offstage for a minute while Leslie soloed, returning as the tune changed direction towards the finale. And that was it for the main set, rather short at just over an hour so a couple of encores were anticipated as Leslie waved and thanked everybody for coming. A couple of minutes later they were tempted back onstage by the cheering crows, hungry for more of the classics, Corky first but he found there's no way to get behind the kit from the right hand side of the stage. 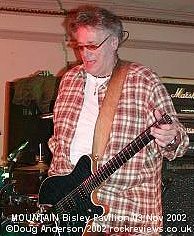 As the others climbed back up onstage Corky walked right over to left side and slipped between backline and kit as calls for "Mississippi Queen" rose from the audience. Indeed MISSISSIPPI QUEEN was the sole encore track though there was a brief segment of the STAR SPANGLED BANNER slipped into the cutting riffs. Indeed Leslie may have been seeing stars at that point as one of Corky's sticks misfired and caught a less than happy looking Mr West from behind. With that they left the stage, Corky taking his coat and hat, and no amount of cheers were going to entice the band back for a further song. So about seventy five minutes after they began the crowd started filing out past the merchandise stall where Corky and Richie soon appeared to signing albums, tickets and other items. Leslie wasn't feeling well and had a sixth day on a row the following evening to conserve his energy for.. 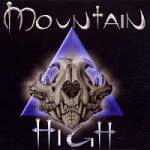 Probably the most surprising thing about the show was that not one track from the latest Mountain album, High (or Mystic Fire if you bought the American import) was played. As this was the second tour this year I expected the idea to be to promote the album. There were certainly LP sized card advertising boards available from the merchandise stall (the American version) to publicise it though no copies on sale. Instead was the now properly pressed version af a private band pressing of an album called 'On the Mark'. I guess more profit is involved with this release but having the proper new album for sale would have helped most of the audience find a copy as HMV and Virgin don't seem able to or interested in stocking it. Also on sale were a variety of paper items, poster, the aforementioned LP prints, photos and picks all signed and marked up accordingly. In the audience was Classic Rock magazines Dave Ling who I had a brief chat with after the show. He is writing a piece for Classic Rock, due out early next year, about life on the road with Mountain. He had interviewed the band during Stray set. Look out for the article and a review of the London show. This page is Copyright © Doug Anderson 2000 - 2002. Created: 4 November, 2002. Last updated: 7 November, 2002.